Family members and civil society member marched today against the abduction of Shabir Baloch, a student leader from Turbat district. 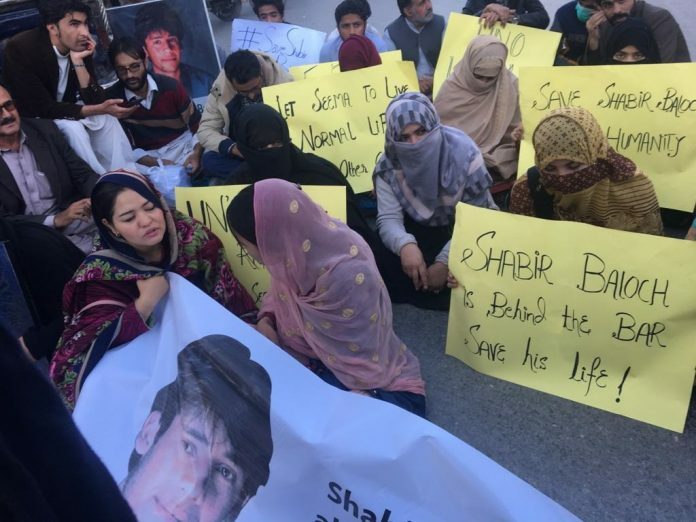 According to the details received by the Balochistan Post, scores of civil society members and the family members marched against the enforced disappearance of Shabir Baloch, a student leader, in Quetta on Thursday. The rally marched through several roads and finally stopped at Press Club Quetta, where protesters belonging to civil society, members of political organizations, young students and the family members of missing Shabir Baloch chanted slogans for the safe release of the student leader. 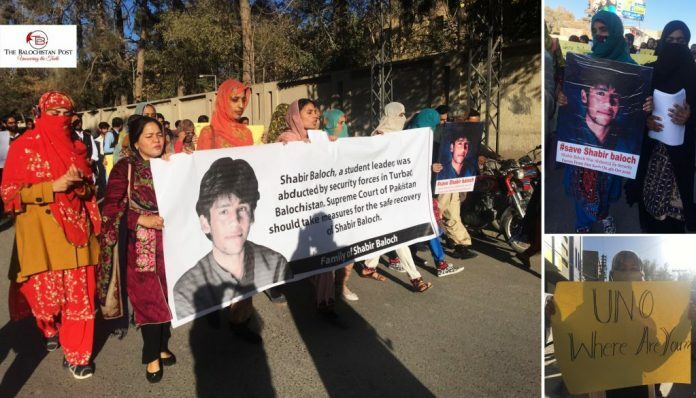 Protestors had brought banners and placards with them, inscribed with different slogans and bore names of other missing persons in Balochistan. Seema Baloch, sister of missing Shabir Baloch, has been protesting for two years and now has joined the Voice for Baloch Missing Persons (VBMP) protest camp for the safe release of her brother in Quetta. During a press conference last week, she said that she had tried to file an FIR in police stations against the abduction of her brother but police rejects to file it saying that they cannot file an FIR against Pakistan’s paramilitary forces. She claimed that Zarina Baloch, Shabir’s wife, and 36 others are ready to testify that it was Pakistani forces who abducted Shabir Baloch on 4th of October in 2016 from Turbat. At the press club, the family appealed the national and international rights organizations to play role in the safe release of their loved ones and end their suffering as they have come far away from their home to seek justice.